2 Days until the doc appointment, 2 days until I know if I can workout, 2 days until I get to leave work early!!!!!! Ok I got that out of my system. That actually reminds me of the opening of Bridget Jones diary so I'll continue the trend. Cigarettes: smoked 0; wanted 19,848,038,948! Work: If I find out who did it I will personally make them eat the entire dozen. Someone dropped these off today at work.... TWO DOZEN chocolate, glazed, sprinkle filled doughnuts. Now these are not my favorite but I could have eaten the entire box today!!!! But Proud Mama Moment I didn't eat one, not even a bite, not even a nibble....VICTORY IS MINE!!!!! I am super focused on the food, like crazy obsessed focused on the food right now! I have not been overwhelmed at work today so I have done a little bit of online shopping and a little bit of magazine shopping. Basically I have some really full shopping carts but no new stuff. I really like to shop in person and not online, but what I want is online because no one around me actually carries them. I really want to try some of the compression socks. I read several running blogs and lots of the girls I read wear them and I think if I have some I will be running 3 hour marathons too. Not Just for Old People anymore!!!! 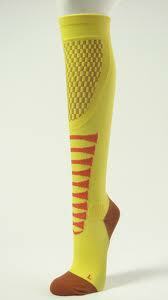 I haven't worn knee socks in years, since high school basketball really, but I just need to try these. I have also found a new paleo "almost" friendly snack. I found a planters trail mix this morning that has nuts and seeds as well as dried fruit in it. The only unfriendly thing in the mix is peanuts. Did you know that peanuts are not actually nuts!? I know, who knew! I can already hear my sisters mocking me. Eating nuts and berries and such, but they know I eat some weird stuff. Actually in Sunday School this week I was eating a piece of coffee cake and I didn't care for it so I gave it to my sister, she said "Of course you wouldn't like it, it has butter and sugar and flavor!" Smarty pants. This Trail Mix is actually pretty good. I didn't know that I liked pumpkin seeds and really only ate one by accident, I just thought it was a big sunflower seed. And its not too salty. Sometimes these mixes are just too salty even for me, and I can do some damage on the salt front. Over all very good snack that I will probably eat again! That's just my morning for ya so there may be another post this evening. I have running group, ballgames and Biggest Loser finale tonight so maybe I can find something to talk about...maybe.